We tried to do something that was so unpredictable that it had no shape and you could never say what the kind of humour was. And I think the fact that "Pythonesque" is now a word in the Oxford English Dictionary shows the extent to which we failed. Deadpan Snarker John Cleese, Straight Man Graham Chapman and musician Eric Idle met at Cambridge University where they were members of The Footlights, a celebrated performing society. Panto-style actor Terry Jones and his writing partner, Nice Guy Michael Palin, had been similarly occupied at Oxford at about the same time. Cleese met cartoonist/animator Terry Gilliam -- the one American in the group, then working for the humor magazine Help!? -- during the US tour of "The Footlights Revue". All save Gilliam were recruited as television writers straight out of college. In the amorphous melting pot that was British radio and TV comedy in the late 1960's -- where alliances drawn from the same talent-pool were constantly formed for short-lived projects and then dissolved -- meetings in various combinations ensued for our heroes, and considerable mutual respect was earned. In 1967 Idle, Palin, Jones and Gilliam wrote and starred in the UK children's TV series, Do Not Adjust Your Set. At the same time Cleese and Chapman joined together with Tim Brooke-Taylor et al. to produce At Last The 1948 Show, and in 1968 the two provided additional material for the unruly satire The Magic Christian. The following year, Cleese and Chapman were offered a show of their own. Who would join them in the new troupe was initially unclear; Brooke-Taylor, later of The Goodies, was seriously considered (Cleese and the three Goodies had been mainstays of much-loved radio comedy sketch-show I'm Sorry, I'll Read That Again), as was jobbing comic actor David Jason. But Cleese really wanted to work with Palin, and Palin's three cohorts were ready to move on to more ambitious fare as well, so in the end it all fell into place naturally. The brash young sextet stormed into a pitch meeting with BBC executives and told them that... they had absolutely no idea what they wanted to do, let alone come up with a title for it. In their heads, though, it was going to be really really cool and groundbreaking and just generally nothing the comedy world had ever seen before -- like the The Goon Show had been, only more so. Incredibly enough, the execs took a flyer on them. The net result was Monty Python's Flying Circus, and a sketch-comedy troupe for the ages was born. British-born/American-raised actress Carol Cleveland is the unofficial seventh member and comedic musician Neil Innes is the unofficial eighth member. Writing chores tended to fall along well-established lines: Cleese with Chapman, Palin with Jones, Idle on his own. Gilliam worked separately on animations and hence appears only very rarely before the camera. Roles -- in the TV show, at least -- were assigned based on who had contributed most to that particular script; thus it's possible to roughly figure out who wrote what based on who's starring in any given sketch. The troupe more or less stopped being active around 1984, and became entirely inactive as a collective when Graham Chapman died in 1989 (the members have stated that they'll be willing to reunite as a group when Graham Chapman returns from the dead). The last time all six were seen together live was in a brief spot in the 20-year reunion special Parrot Sketch Not Included, where host Steve Martin revealed they were all being kept in a closet (with a visibly-ailing Chapman seated in the middle with the other five); the special aired the day after Chapman's death that October. 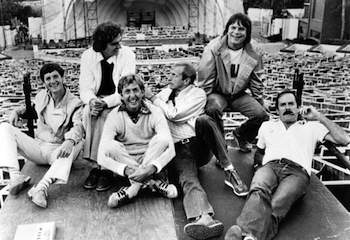 The remaining members still occasionally perform either on stage or in each other's films (the two who most often collaborate together post-1984 have been Cleese and Palin), with a 1998 reunion in Aspen (with Eddie Izzard in tow) featuring all five surviving members. Further reunions have taken place in recent years. Most things "Monty Python" nowadays (such as Spamalot) fully involve only Eric Idle, with the others as occasional drop-ins. Terry Gilliam now mainly works as a director; Terry Jones is a novelist; Michael Palin makes travel documentaries; John Cleese is still the grumpy old face of British comedy, though he has also appeared in two of the most popular UK film series of all time -- the James Bond films (playing Q in two films) and as a ghost in two early Harry Potter films; and Graham Chapman has continued to remain dead.